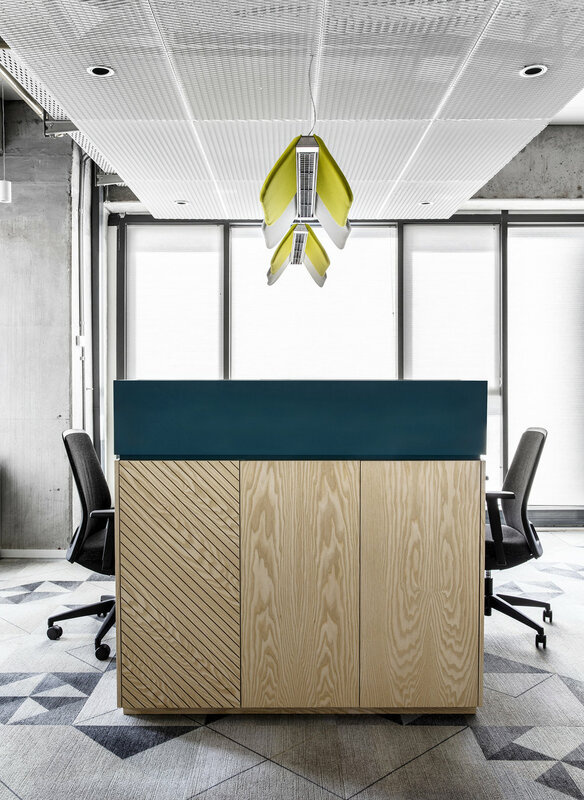 The 1,500 square meter office occupies and entire floor of the new Alon Towers in the heart of Tel Aviv’s business centre. 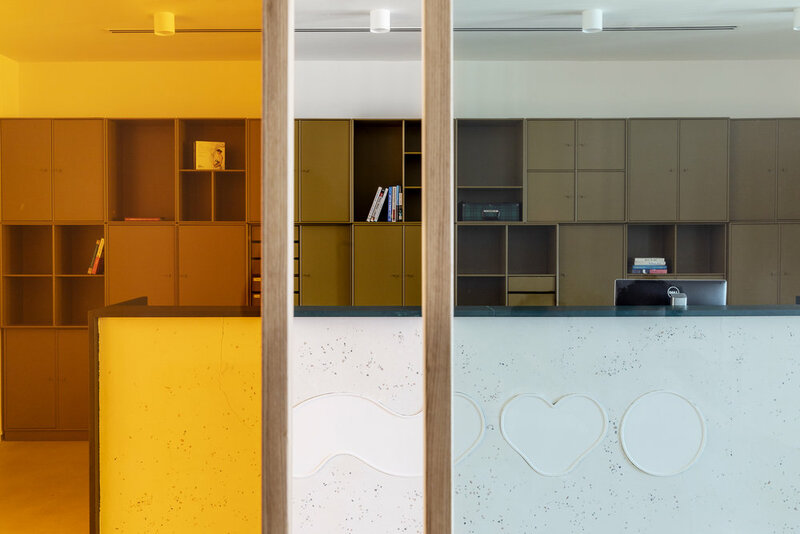 Roy David Architecture was commissioned to design a space that reflected both the data-centred and feminine nature of the company’s primary product, a revolutionary fetal monitor that vastly improve a segment of healthcare that has remained largely unchanged for decades. The company, founded in 2007, has dedicated itself to developing wearable, sensor-based technologies for pregnancy health. The NUVO Group has transformed the experience of pregnancy by connecting mothers and physicians to real-time information that enables healthcare providers to better manage the experience for both mothers and babies while reducing cost to healthcare systems. The primary design challenge was to create a space that not only spoke to the nature of the unique products NUVO Group creates and develops, but also to provide a variety of working environments that would accommodate the unique and highly technical work done by the company’s employees; work ranging from textile testing and development and algorithms to Marketing and Finance. The solution was to create a Research and Development “HUB”, a dynamic and multipurpose open space, housing the entire research and development team. 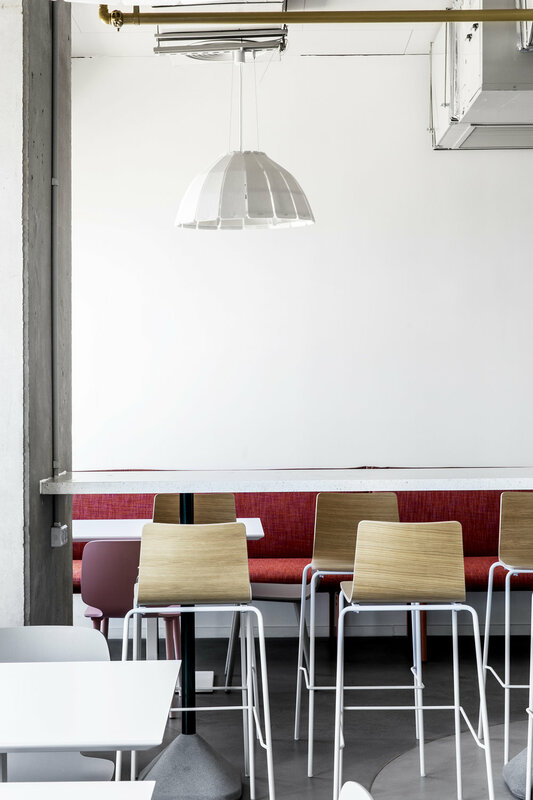 The space is comprised a variety of meeting and collaborative spaces, ranging from privacy booth seating to formal meeting rooms. The HUB is also home to the several of the company’s labs, facilitating access to the employees who utilize the equipment daily. The space itself was planned to provide a sense of privacy and functionality. 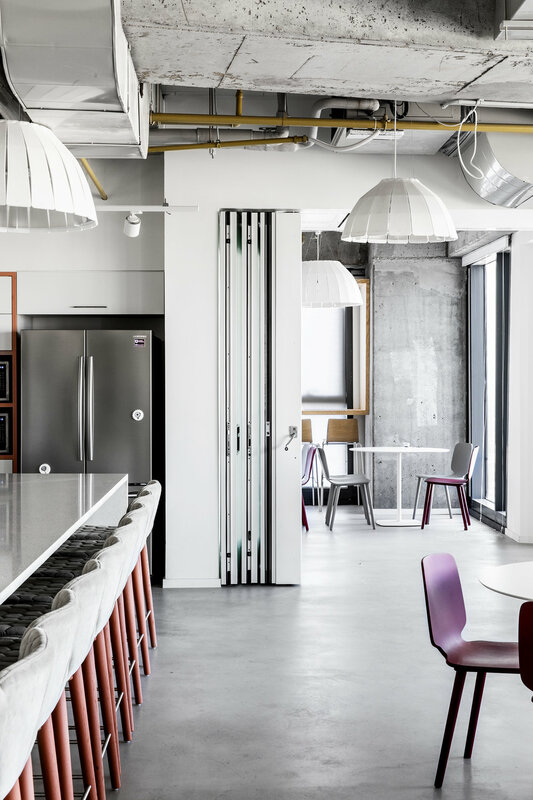 The designer worked with a carpenter to create custom multi-purpose furniture pieces that create the divisions required between the teams as well as provided the employees with integrated writing surfaces and storage near their work stations. 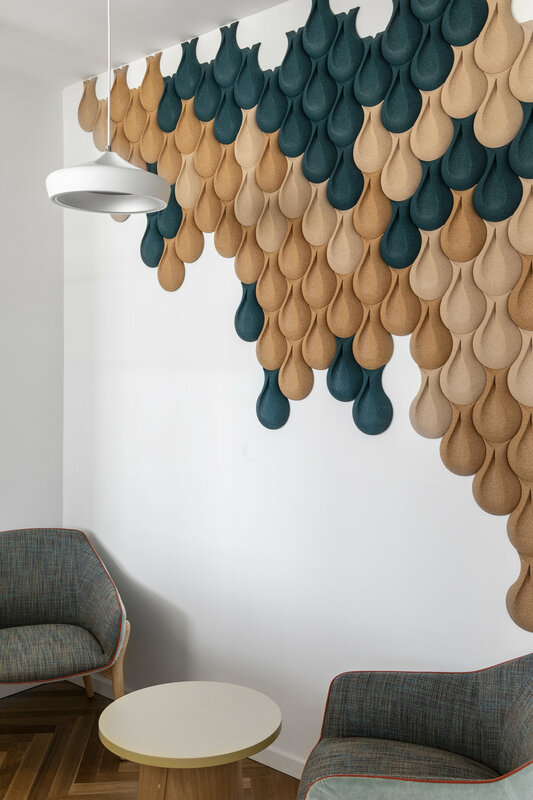 The design language is closely tied to and inspired by the unique nature of the company’s primary product, one whose design is soft and feminine in nature, but whose function and development is based on complex data and technology. 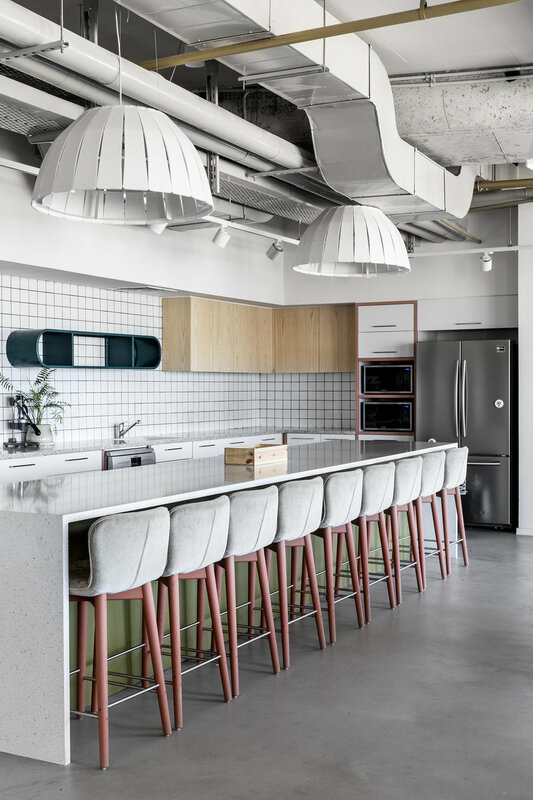 The designer chose elegant and soft lines and colors, light ash wood, olive and coral finishes, to define the space that work in sync with more linear elements that can be seen, for example, in details of the custom furniture and ceiling elements throughout the space. The design concept is made clear upon entrance to the office space, by the angular and grid-like reception desk and accompanying storage system planned in parallel with the curved lines of the ceiling detail and dividing partitions, both of which were inspired by the female form during pregnancy. All offices and work stations are located along the curtain wall, to allow for the employees to enjoy the magnificent urban and sea views from the 26th floor. 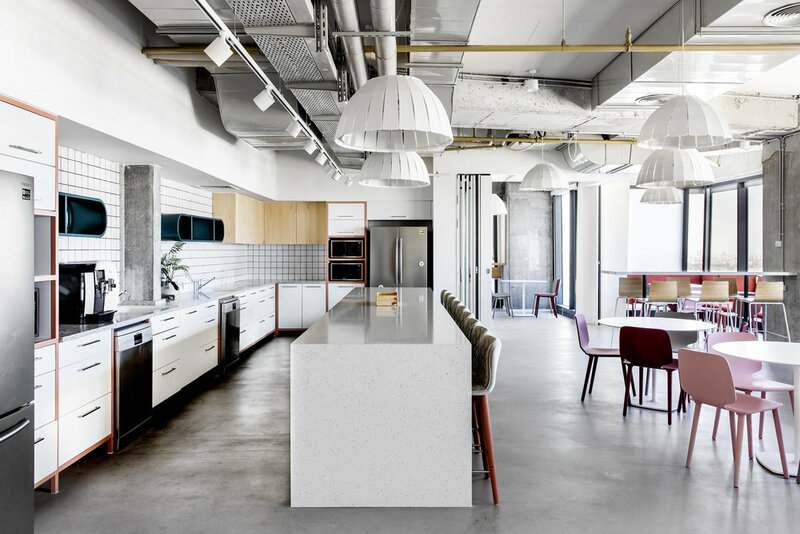 The large kitchen space, additionally utilized as an all-company meetup and conference space, was also planned to take advantage of the views. 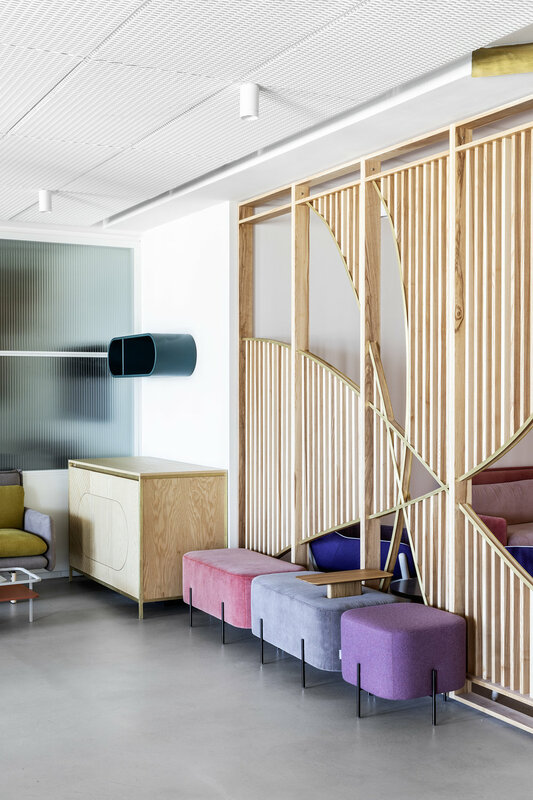 The designer worked together with Spanish furniture designers, SANCAL to create a custom solution for the window-line seating with their REW Kitchen line. 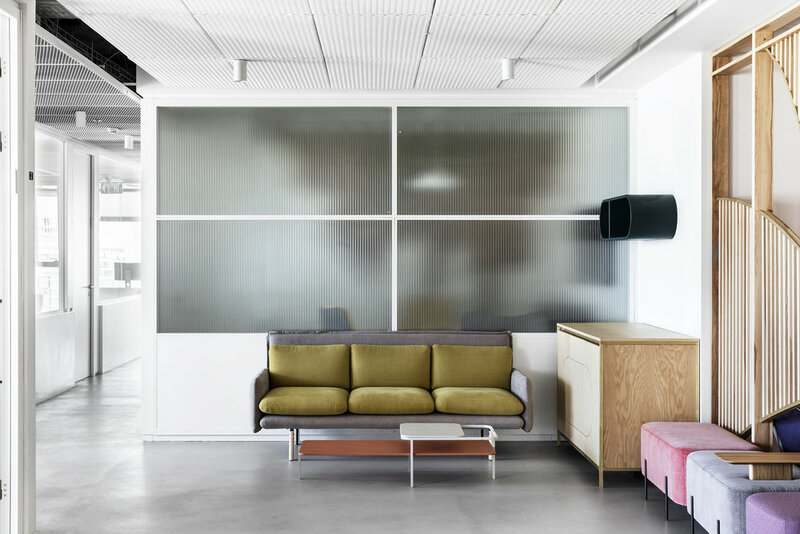 The designer also created a custom laptop bar along the curtain wall to provide employees with an alternative workstation for private and collaborative work.